Rich botanical cream helps transform a compromised barrier into smooth, moisturized skin. 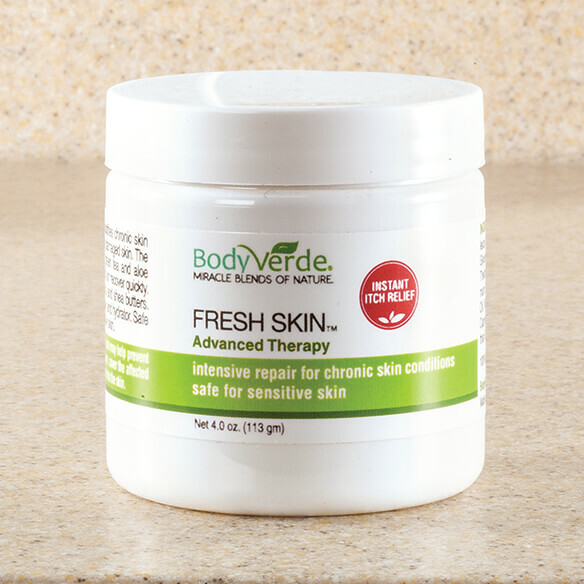 Fresh Skin Advanced Therapy instantly soothes dry, itchy skin with antiseptic tea tree oil and anti-inflammatory green tea and aloe vera. As it helps protect and repair damaged skin, it hydrates. Soothes eczema, psoriasis, dermatitis, rashes from allergic reactions, fungal infections, bug bites, poison ivy and dry, cracked skin. Apply to targeted areas with the circular massage until completely absorbed. Looks like a good product to try. BEST ANSWER: Thank you for your question. The ingredients are Purified water, Tea Tree Oil, Glycerin, Aloe Vera, Green Tea Extract, Vitamin E, Olive Oil, Emulsifying Wax NF, Cetyl Alcohol (vegetable derived fatty alcohol, helps retain moisture), Sodium Citrate, Xanthan Gum, Phenoxyethanol, Caprylyl Glycol, Cocoa Butter, Shea Butter, Sorbic Acid. We hope this information will be of help to you.